In addition to the new dedicated bike lane on Spring Grove Avenue that will provide a critical north/south travel corridor for bicyclists through the heart of the city, the City has also announced a new pilot project for shared lane markings (sharrows). Sharrows are widely used but have yet to be embraced in the 32nd ranked state for bicyclists that has no cities included on the bicycle friendly list. They improve the safety for bicyclists on streets that lack dedicate bike lanes. With sharrows, motorists are made more aware of their surroundings making it more difficult to ignore a bicyclist that is properly sharing the road with motorists. The Cincinnati Sharrow Pilot Project has identified a few corridors that the City believes are good candidates for sharrows and is planned to start this spring. The City is currently asking for input and have put a survey up for people to vote on the top 2 corridors for potential sharrows. 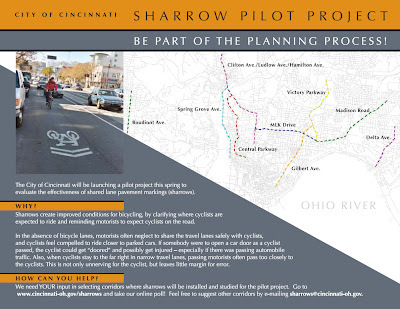 You can also email them with additional ideas and other corridor suggestions at sharrows[at]cincinnati-oh[dot]gov. The City of Cincinnati currently boasts 55 miles of streets designated as bike routes (24 of which include signage), over 200 bicycle racks citywide, with an estimated 63 miles of bike/hike trails in the planning stages all as part of the City’s Bicycle Transportation Program. To request bike rack installation, report potholes, missing signs or any other bicycling related issue you can contact the City by calling (513) 591-6000.